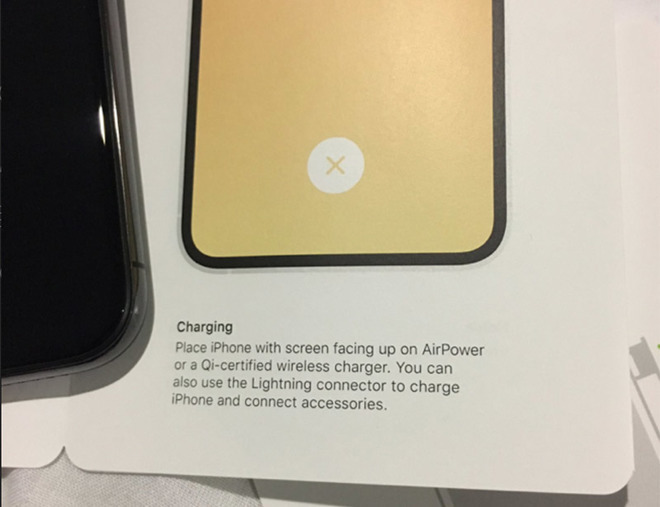 As noted by developer Gavin Stephens in a tweet on Thursday, Apple urges new iPhone XS owners to charge their device with AirPower or a Qi wireless charger. Apple mentions AirPower under the "Charging" section of its usual instructional pamphlet. Wording used suggests the company planned to position the device as a main charging source, with Lightning offered as an alternative. Announced alongside last year's slate of iPhones, AirPower is marketed as an all-in-one power delivery solution for the company's portable device lineup. The charger features in-house developed technology that allows users to juice up multiple devices simultaneously, including the non-Qi compliant Apple Watch and an as-yet-unreleased AirPods wireless charging case. Some expected AirPower to launch with iPhone XS, but the product failed to make an appearance during last week's hardware unveiling. Further, Apple scrubbed nearly all mention of AirPower from its website following the event. One photo of the device remains on a page dedicated to AirPods. The abrupt removal prompted speculation that AirPower might never arrive, and Apple refuses to comment on the matter. Rumors circulated on Monday suggest technical issues, namely heat and radio communication troubles, are to blame for the delay. Reports claim a new AirPower device will see release as soon as next spring. As AppleInsider explained last week, AirPower is an advanced charging solution that requires a number of cutting edge technologies to work together in order to function properly. Specifically, AirPower is thought to rely on multiple flux generators that work in tandem to intelligently deliver power to three devices at the same time, a more complex system than common Qi chargers.